There is still time to play along with our current challenge at Time Out. 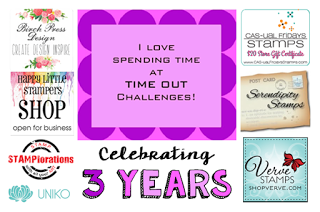 This is a very special challenge, as it is our 3rd birthday. It's our birthday, but you might get the present....we have several sponsors offering prizes for this challenge. Love and/or Friendship with the optional twist of Spotlight Stamping. I made this card at the same time as I made the card I showed last week. I was practicing my Copic coloring, and ended up liking both versions of almost the same card. Please head over to Time Out to see more inspiration from our Design Team and Guest Designer. Our Guest Designer this week is Ardyth, so please stop by her blog to see what she has created for this challenge. Details for all the prizes are on the Time Out Challenge Blog. Practice makes perfect! You must be practicing a lot lately!!! Your coloring is WONDERFUL on this fantastic composition. I love it. Beautiful colouring Joyce, you are getting so good. Love your spotlight colouring too, you always do it so well! Absolutely gorgeous Joyce! Love your stunning coloring...and of course am so happy to be on this team with you! You've worked your artistic magic on another beautiful card!! Love this Joyce! Another brilliant spotlight card! This design truly works wonderfully! Ohhhhh...this is one stunning card Joyce! Your flowers are so beautiful and your coloring is shear perfection! I love this In Bloom stamp set, and how perfectly it works for this technique! Beautiful card, Joyce! I love this one as much as your card from last week! Great highlighting that flower! Very pretty card! Your colouring looks great, Joyce and I think you've used the perfect stamps to practice!!!! You created a lot of depth on those flowers and your spotlighting is lovely!!! !